Dee Zhen is a fourth year medical student from Monash University with an interest in intensive care as well as obstetrics and gynaecology. He enjoys research and plans to take part in more research in the future. Introduction: Subchorionic haematoma (SCH) is the most common ultrasound abnormality found in women with symptoms of threatened miscarriage. It refers to a collection of blood between the chorionic membrane and the uterine wall. Depending on the time the haematoma is formed, it may appear as either hypoechoic or hyperechoic on the ultrasound. The cause of SCH may be related to poor placentation. 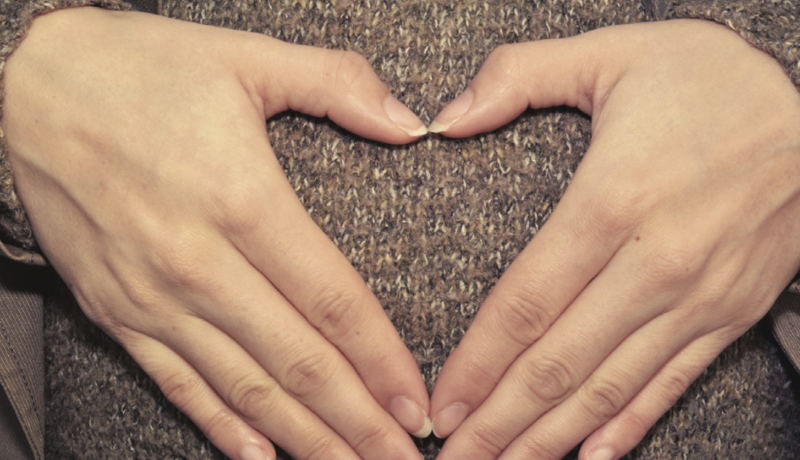 Although SCH is common, the effects of SCH on pregnancy outcomes are unclear. The review aims to provide an overview of the effects of SCH on pregnancy outcomes and identify prognostic factors that may predict adverse pregnancy outcomes in women with SCH. Methods: To identify the relevant literature, electronic databases (PubMed and EMBASE) were searched using the search terms: “subchorionic haematoma” and “subchorionic hemorrhage”. Exclusion criteria include multiple pregnancy, ectopic pregnancy, Breus mole, review articles, case reports, and studies that did not focus on the effects of SCH on pregnancy outcomes. Results and conclusion: Women with SCH have an increased risk of placental abruption. Studies are conflicting on the risk SCH poses on pregnancy loss. There are only limited studies on other adverse pregnancy outcomes such as preterm delivery, small for gestational age, pre-eclampsia, and chorioamnionitis. Factors that may predict an increased likelihood of adverse pregnancy outcomes in SCH include: large haematoma size, fundal or retroplacental location, early gestational age of diagnosis (before 9 weeks), and severity of symptoms. Persistent SCH is rare but it carries a high risk of complications, including chorioamnionitis. Up to 25% of pregnant women experience symptoms of threatened miscarriage, namely first trimester per vaginum (PV) bleeding with or without uterine contractions . The most common ultrasound abnormality in these women is a subchorionic haematoma (SCH) . SCH is a collection of blood between the chorionic membrane and the uterine wall . Typically, it appears as a crescenteric hypoechoic lesion around the gestational sac . According to a 2014 retrospective cohort study from Turkey, the reported incidence of SCH in women with symptoms of threatened abortion is 18.2% . In the general obstetric population, the incidence of SCH varies between 1.7% to 3.1% [4,5]. The exact pathophysiology of SCH is still unknown. Nevertheless, the underlying cause of SCH is believed to be poor placentation [3,6]. Poor placentation can impair angiogenesis and lead to the formation of weak vessels that tear easily [3,6]. In SCH, it is postulated that the marginal utero-placental veins tear and cause low pressure bleeding . The blood then tracks around the gestational sac to form a cresenteric haematoma between the chorionic membrane and the uterine wall . In contrast, the bleeding in placental abruption is usually high pressure bleeding from ruptured spiral arterioles . Results from a recent Japanese study appear to support the theory that SCH is caused by poor placentation . The study found that SCH is more common in women with risk factors for poor placentation such as multiparity and pregnancies conceived through in-vitro fertilisation, especially those using a frozen-thawed embryo transfer . While some SCH are asymptomatic, most can present with first trimester PV bleeding with or without uterine contractions [5,10]. In most cases (up to 70%), PV bleeding of varying degree, ranging from spotting to heavy bleeds, can continue intermittently for 1 – 3 months after the diagnosis of SCH . The symptoms usually resolve spontaneously during the second trimester . However, a small minority of women (0.46% of all obstetric patients) can have a persistent SCH that remains symptomatic until delivery . SCH is diagnosed using ultrasound (Figure 1). The characteristic sonographic finding is a hypoechoic cresenteric lesion between the chorionic membrane and the uterine wall . The haematoma may appear hyperechoic initially but with time, it becomes hypoechoic . Possible differential diagnoses for this sonographic finding include chorioamniotic separation and twin gestational sac . Figure 1. First trimester subchorionic haematoma. Although SCH is very common in women with symptoms of threatened miscarriage, the effects of SCH on pregnancy outcomes are unclear. This review aims to provide an overview of the effects of SCH on pregnancy outcomes. It also aims to identify prognostic factors that may predict adverse pregnancy outcomes in women with SCH. To identify the relevant literature, electronic databases (PubMed and EMBASE) were searched using the search terms: subchorionic haematoma and subchorionic hemorrhage. The search was limited to English-language human studies published between January 1981 and June 2016. A total of 192 studies were identified from the database search and an additional 14 studies were identified from manual review of bibliographies. 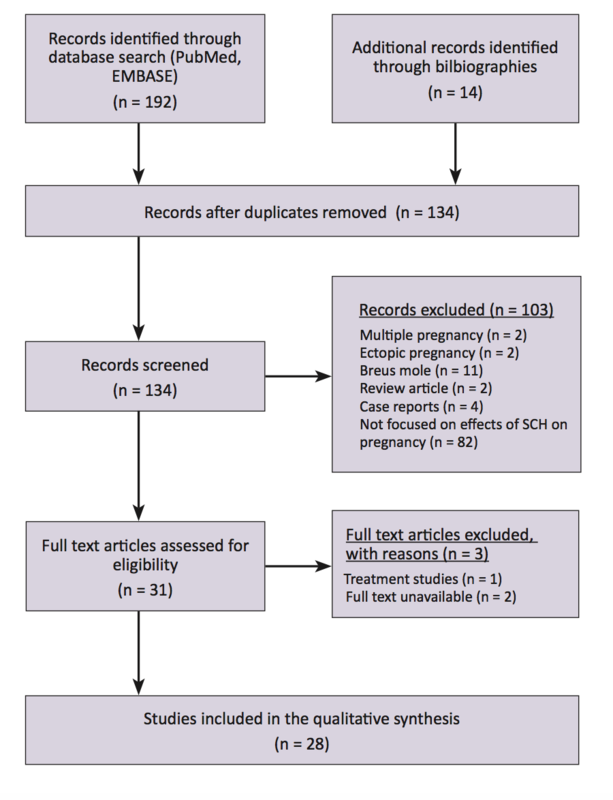 After removing the duplicates, studies were excluded for reasons such as multiple pregnancy (n = 2), ectopic pregnancy (n = 2), Breus mole (n = 11), review articles (n = 2), case reports (n = 4) and different study focus (n = 82) (Figure 2). For this review, 28 studies discussing the effects of SCH on pregnancy outcomes were included. Figure 2. PRISMA study flow diagram. Adverse pregnancy outcomes that may be associated with SCH include early and late pregnancy loss, placental abruption, preterm delivery (PTD), preterm premature rupture of membrane (pPROM), small for gestational age (SGA) and chorioamnionitis. The pathophysiological mechanisms behind how SCH might contribute to these adverse pregnancy outcomes remains unclear. It is thought that SCH may cause pregnancy loss through either a direct mechanical effect or an indirect inflammatory response . As for placental abruption, studies suggest that the underlying cause of SCH – poor placentation – also predisposes the patients to placental abruption [5,13]. In several studies, SCH is associated with an increased risk of miscarriage (pregnancy loss before 20 weeks) and stillbirth (pregnancy loss after 20 weeks). In a recent study, Sukur et al. reported that the miscarriage rate was significantly higher in women with SCH compared to those without (29.5% versus 12.6%). A similar finding was obtained by Kurjak et al. . According to Ozkaya et al. , the risk of miscarriage was six times higher in women with SCH (OR = 6.29, 95% CI 1.43 – 37.7). In a separate study, the risk of miscarriage remained significantly higher in cases of SCH even after PV bleeding has stopped . Stillbirths are also more common in women with SCH compared to women without SCH . Ball et al. found that the risk of stillbirth was significant when compared to women both with and without PV bleeding. From a meta-analysis performed in 2011, SCH doubled the risk of miscarriage and stillbirth (OR = 2.18, 95% CI 1.29 – 3.68 and OR = 2.09, 95% CI 1.20 – 3.67, respectively) . Based on the meta-analysis, for every 11 women with SCH, there was one additional miscarriage . However, some studies had contrasting results. Two small studies (n = 22, n = 62) of SCH did not find that SCH increases the miscarriage rate [17,18]. In one of these studies, there were no miscarriages in all 22 cases of SCH studied . Tower and Regan  studied the effect of SCH in a population with recurrent miscarriages. They found that SCH did not increase the miscarriage rate for these patients . Based on a 2003 prospective study, women with SCH also did not have a significantly higher risk of stillbirth . In a large retrospective study, the risk of stillbirth in women with SCH was not significant after adjusting for ethnicities, PV bleeding, chronic hypertension, pregestational diabetes, and smoking . The mixed results from different studies suggest that the effect of SCH on pregnancy loss is complicated. Not all cases of SCH have an equal risk of miscarriage and stillbirth. The likelihood of pregnancy loss in SCH may depend on several prognostic factors, such as the size and location of haematoma. Unlike the risk of pregnancy loss, the risk of placental abruption in women with SCH is well established. When SCH is present, the risk of placental abruption increases from 0.6% to 3.6% (aOR = 2.6, 95% CI 1.8 – 3.7) . This finding is echoed by several other studies [5,13,20]. From a meta-analysis that pooled together the results of four different studies, SCH increased the risk of placental abruption by more than fivefold (OR = 5.70, 95% CI 3.91 – 8.33) . The number needed to harm was only 34 . Given that studies have consistently reported that women with SCH have a higher risk of placental abruption, SCH most likely has a true effect on the risk of placental abruption. Studies also found that women with SCH have a significantly higher risk of PTD [4,5,20,21]. In 2003, Nagy et al. reported that SCH doubled the risk of PTD (RR = 2.3, 95% CI 1.6 – 3.2). In their study, 43% of these PTD cases occurred before 34 weeks and 10% occurred before 28 weeks . This result was corroborated by a large retrospective cohort study from 2010, which included more than 1000 cases of SCH . More recently, Palatnik and Grobman  carried out a multivariable regression analysis and showed that SCH increased the risk of PTD independent of mid-trimester cervical length. There were several studies that did not find a correlation between SCH and preterm delivery [3,13,14,18,19]. However, these studies were smaller in size, with only one of the studies having more than 100 cases of SCH . Nevertheless, more studies are required to confirm the risk of PTD in women with SCH. Chorioamnionitis is a rare but severe complication in pregnancy that can cause life-threatening neonatal sepsis. Currently, the risk of chorioamnionitis in women with SCH is still unknown. There was only one study that extensively investigated the risk of chorioamnionitis in SCH . In that study, Seki et al. reported that chorioamnionitis was particularly common amongst women with persistent SCH. Six out of 22 women (27.3%) with persistent SCH had chorioamnionitis . Half of these women had a miscarriage, while the other half delivered preterm . In the study, persistent SCH was defined as a haematoma with clinical symptoms that lasted until delivery . Recently, a study found that women with SCH had significantly different vaginal swab culture results . Women with SCH had significantly higher prevalence of coagulase-negative Staphylococcus and Gardnerella vaginalis and lower prevalence of Lactobacillus on vaginal swabs . The culture result is suggestive, though not diagnostic of bacterial vaginosis, a condition that has been associated with chorioamnionitis, pPROM, and PTD . However, in that study, the swabs were only collected in the second trimester, which was temporally distant from the time SCH was diagnosed . Hence, a direct cause and effect relationship could not be confirmed through the study . The risk of chorioamnionitis in women with SCH warrants further investigation. Given that SCH may be associated with poor placentation, it is important to also consider other adverse pregnancy outcomes typically associated with poor placentation such as SGA and pre-eclampsia. SCH was associated with a significantly higher risk of SGA in two studies [5,15] and and pre-eclampsia in one study . However, the majority of the studies did not support a significant relationship between SCH and SGA [3,4,12,13,19,20]. SCH was also not associated with pre-eclampsia in multiple studies [4,12,19,20]. More importantly, in the two largest controlled studies on SCH (n = 512 and n = 1,081), SCH did not increase the risk of SGA or pre-eclampsia [4,20]. Limited studies recorded the incidence of pPROM in women with SCH. In a study by Palatnik and Grobman , pPROM was significantly more common in women with SCH compared to women without SCH (6.4% versus 4.0%). However, this finding was not reciprocated in two other studies [4,12]. Interestingly, Nagy et al. noted that women with SCH had significantly higher rates of an abnormally adherent placenta that required manual removal (13.9% versus 4.9%). Previously, two uncontrolled studies also noted that manual placenta removal was required in 7% and 11.1% of women with SCH [10, 23]. More controlled studies are needed to provide information about the risk. The likelihood of adverse pregnancy outcomes in SCH may depend on several prognostic factors. Differences in the size, location, and persistency of SCH, as well as, the gestational age of diagnosis and the severity of symptoms can all change how SCH affects pregnancy . Examining these factors in closer detail can help clinicians clarify the risk of SCH. The risk of adverse outcomes may be increased with larger haematoma size. In the original case series on SCH, Mantoni and Pederson  noted that SCH > 50mL occurring after 16 weeks gestation increased the risk of spontaneous abortion and PTD but SCH < 35 mL had a good prognosis. In one study, all women had SCH < 16 mL and none of them had a miscarriage . In contrast, another study found that 81% of the pregnancies with SCH > 60 mL did not continue to term . The rate of miscarriage appeared to be vastly different depending on the size of the SCH. Ozkaya et al. used a receiver operating characteristic curve analysis (ROC) and determined that haematoma > 32 mL was 81% sensitive and 80% specific for predicting the risk of miscarriage. The size of haematoma was also shown to be an important factor for miscarriage in several other studies [23,26-29]. However, many studies did not observe an association between size and pregnancy loss [1,13,14,16,18,30,31]. Predicting the risk of miscarriage with the size of haematoma is controversial because of the mixed evidence. It has been suggested that size is not the best indicator of the extent of subchorionic bleeding . This is because a larger haematoma can be caused by either an increase in subchorionic bleeding and a decrease in cervical drainage as PV bleeding . This may explain why several studies did not find the size to be predictive of poor prognosis. While size may not correlate linearly with increased risk of miscarriage, haematoma above a certain volume may still confer a higher risk. This is because regardless of the cause, a larger haematoma can have more direct pressure-volume effect on the pregnancy. A significantly larger haematoma may also have greater placental involvement. Currently, the size of haematoma remains a controversial predictor of poor outcome. Haematomas in certain locations may have a worse prognosis. Most SCH are located on the anterior aspect of the uterus and at the peripheries of the placenta [5,17]. Haematomas that were retroplacental or fundal had significantly higher rates of pregnancy loss according to several studies [14,29,30]. A fundal haematoma was four times more likely to cause a miscarriage compared to supra-cervical haematoma (27.5% versus 6.6%) . While retroplacental location was a significant risk factor, Nyberg et al. found that ultimately, it was the degree of placental involvement that best predicted foetal mortality. Using a multiple logistic regression analysis, Nyberg et al. showed that the location was no longer significantly associated with foetal mortality after adjusting for placental involvement. Without any placental involvement, foetal mortality was only 8% . When 20 – 50% of the placenta was involved, foetal mortality climbed to 20%. Greater than 50% of placental involvement resulted in a 75% foetal mortality rate . Based on the current evidence, greater placental involvement and retroplacental or fundal location of haematoma may all be important risk factors for the poorer prognosis amongst women with SCH. Most SCH will self-resolve in the second trimester but some can remain symptomatic until the delivery. This persistent SCH is rare and was only present in 0.46% of the general obstetric population . Persistent SCH may carry a worse prognosis. Seki et al. studied 22 cases of persistent SCH and found that while the miscarriage rate was not particularly high (13.6%), most women with persistent SCH experienced preterm labor (77.3%), half of which occurred before 32 weeks. There was also a high prevalence of chorioamnionitis amongst women with persistent SCH (27.3%) . Aoki et al. also found that there is a higher rate of complications, including PTD, SGA, and neonatal lung disease in ten cases of persistent SCH . Although there were no other studies on haematoma that persisted until delivery, several studies observed that haematoma that was slow to resolve or was associated with prolonged PV bleeding had higher rates of pregnancy loss [1,10,23,27]. The evidence is limited but persistent SCH appears to be associated with higher complication rates. An earlier gestational age of diagnosis of SCH has been found to be a risk factor for worse outcomes in several studies. From a 2005 observational study, SCH diagnosed before 9 weeks has a significantly higher risk of pregnancy loss and an adverse outcome compared to SCH diagnosed after 9 weeks (aOR = 18.29, 95% CI 2.36 – 41.46 and aOR = 2.22, 95% CI 1.13 – 4.40, respectively), even after adjusting for other factors such as haematoma size and maternal age . The study also showed that the risk of pregnancy loss increased from less than 2% to 20%, if the diagnosis occurred before 9 weeks . Similar results were obtained by Bennett et al. . However, the studies were not clear on when the symptoms of PV bleeding occurred in relation to the diagnosis of SCH. Furthermore, many other studies did not agree that an earlier gestational age of diagnosis was a significant prognostic factor [16,27,29,34]. In one study, an earlier gestational age of diagnosis was strongly associated with preterm labor but not pregnancy loss . Yet, according to a 2003 study, there was no significant correlation between gestational age of diagnosis and risk of PTD . Based on the current evidence, gestational age of diagnosis is not a clear risk factor for worse outcomes. A probable mechanism on how an earlier gestational age of diagnosis leads to adverse outcomes is also lacking in the existing studies. Asymptomatic SCH are common and benign [13,23,35]. In women with SCH, those that experienced PV bleeding were more likely to have PTD than those who were asymptomatic (OR = 4.8, 95% CI 1.2 – 15.9) . Based on a study by Abu-Yousef et al. , most women (83%) with moderate-to-heavy PV bleeding had an unfavorable outcome. In contrast, most women (75%) with light PV bleeding had a favorable outcome . The risk of an adverse pregnancy outcome is higher with more severe symptoms in SCH. Despite the effects SCH might have on pregnancy, there is no specific management guideline for SCH. This is partly because there are only limited studies on how to manage SCH. Currently, most women with SCH are regularly monitored using ultrasound until the haematoma resolves. Otherwise, women with SCH are managed similarly to other women with threatened miscarriage, with advice on bed rest and supplementary progestogen. However, bed rest is not considered to be beneficial for women with threatened miscarriage based on the results of a Cochrane review . There was one non-randomised controlled trial that showed a lower miscarriage rate in women with SCH that had bed rest (6.5% versus 23.3%) . However, given that the study lacked randomisation and was performed retrospectively, the evidence is weak and inconclusive. In terms of progestogen, a Cochrane review of four randomised controlled trials found that it reduced the rate of spontaneous abortion in women with threatened miscarriage significantly (RR = 0.53, 95% CI 0.35 – 0.79) . The beneficial effects of progestogen may be related to its immunomodulatory properties. Progestogen increases the production of progesterone-induced blocking factor, which favors T-helper cell type 2 response [39-41]. Besides that, progestogen may also help by promoting implantation and inhibiting uterine contraction and cervical dilation [39,41]. In several trials, progestogen was beneficial for women with SCH [40,41]. Pandian reported that dydrogesterone given as 40 mg/day stat. followed by 10 mg twice daily until 16 weeks gestation reduced the miscarriage rate by 15.9% (OR = 0.36, 95% CI 0.172 – 0.756) . In another study, taking 40 mg of oral dydrogesterone daily until 16 weeks gestation resulted in maintenance of pregnancies for 93% of women with SCH . Although the results are encouraging, more studies are needed to confirm the benefits of progestogen. Patients and clinicians should weigh the cost and benefits carefully, before starting on progestogen treatment. A novel drug, called vaginal alpha lipoic acid (ALA), is currently being investigated for its potential use in SCH management . A randomised controlled trial has shown that women taking 10 mg of vaginal ALA had faster resorption of SCH compared to women taking 400 mg progesterone and women without any medication . ALA is thought to be beneficial because of its immunomodulatory properties . However, the trial was a small pilot study with only 76 patients . It is not powered to detect a change in the clinical outcome of miscarriage rate (3/27 in ALA group and 6/27 in progesterone group) . It is still unclear whether faster resorption of SCH would improve clinical outcomes. For women with symptoms of threatened miscarriage, SCH is the most common ultrasound abnormality detected. It has been suggested that the cause of SCH may be poor placentation, which leads to formation of weak marginal uteroplacental veins that tear and bleed. SCH significantly increases the risk of placental abruption but studies are still conflicting on whether it increases the risk of pregnancy loss and other adverse outcomes including PTD, SGA, pre-eclampsia, and chorioamnionitis. Predictors of poor outcomes include the size of haematoma, location with greater placental involvement, persistency of haematoma, earlier gestational age of diagnosis, and severity of symptoms. Management of SCH involves regular ultrasound monitoring. There are potential benefits with bed rest and supplementary progestogen in some studies but the evidence is still limited. Vaginal ALA is a novel treatment option that is still under investigation. In the future, larger controlled studies that measure all the various prognostic factors will help provide better information on the risk posed by SCH. I would like to thank Dr. Shavi Fernando for his advice and the Monash Diagnostic Imaging Department for providing the ultrasound image of the subchorionic haematoma. Goldstein SR, Subramanyam BR, Raghavendra BN, Horii SC, Hilton S. Subchorionic bleeding in threatened abortion: sonographic findings and significance. AJR Am J Roentgenol. 1983;141(5):975-8. Trop I, Levine D. Hemorrhage during pregnancy: sonography and MR imaging. AJR Am J Roentgenol. 2001;176(3):607-15. Sukur YE, Goc G, Kose O, Acmaz G, Ozmen B, Atabekoglu CS, et al. The effects of subchorionic hematoma on pregnancy outcome in patients with threatened abortion. Journal of the Turkish German Gynecological Association. 2014;15(4):239-42. Norman SM, Odibo AO, Macones GA, Dicke JM, Crane JP, Cahill AG. 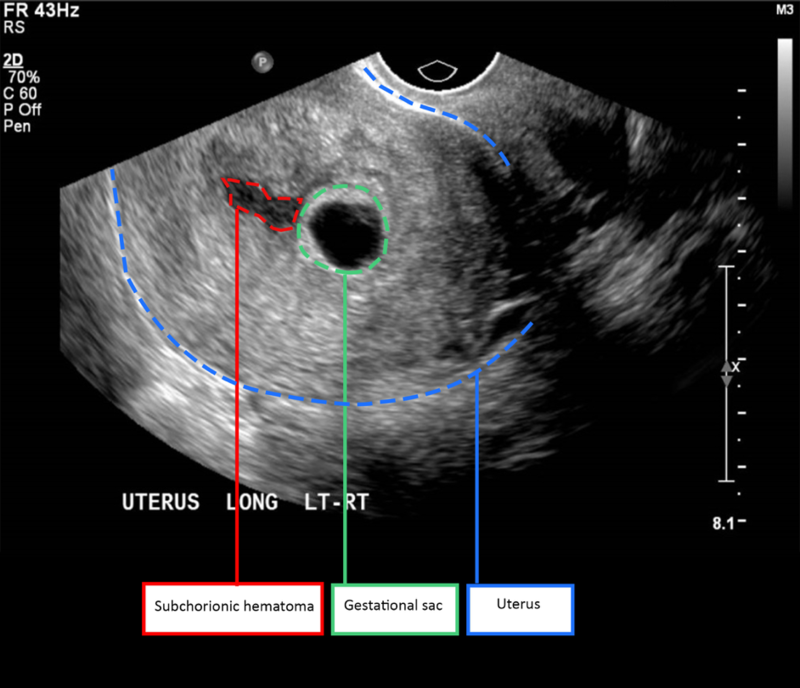 Ultrasound-detected subchorionic hemorrhage and the obstetric implications. Obstet Gynecol. 2010;116(2 Pt 1):311-5. Nagy S, Bush M, Stone J, Lapinski RH, Gardo S. Clinical significance of subchorionic and retroplacental hematomas detected in the first trimester of pregnancy. Obstet Gynecol. 2003;102(1):94-100. Tuuli MG, Norman SM, Odibo AO, Macones GA, Cahill AG. Perinatal outcomes in women with subchorionic hematoma: a systematic review and meta-analysis. Obstet Gynecol. 2011;117(5):1205-12. Hertzberg BS, Middleton WD. Placenta, Umbilical cord, and cervix. Ultrasound: The Requisites. Third ed: Elsevier Health Sciences; 2015. p. 469-95. Goldstein C, Hagen-Ansert SL. First-trimester complications. Textbook of Diagnostic Sonography. Seventh ed: Mosby; 2011. p. 1081-102. Asato K, Mekaru K, Heshiki C, Sugiyama H, Kinjyo T, Masamoto H, et al. Subchorionic hematoma occurs more frequently in in vitro fertilization pregnancy. Eur J Obstet Gynecol Reprod Biol. 2014;181:41-4. Jouppila P. Clinical consequences after ultrasonic diagnosis of intrauterine hematoma in threatened abortion. J Clin Ultrasound. 1985;13(2):107-11. Seki H, Kuromaki K, Takeda S, Kinoshita K. Persistent subchorionic hematoma with clinical symptoms until delivery. Int J Gynaecol Obstet. 1998;63(2):123-8. Johns J, Hyett J, Jauniaux E. Obstetric outcome after threatened miscarriage with and without a hematoma on ultrasound. Obstet Gynecol. 2003;102(3):483-7. Ball RH, Ade CM, Schoenborn JA, Crane JP. The clinical significance of ultransonographically detected subchorionic hemorrhages. Am J Obstet Gynecol. 1996;174(3):996-1002. Kurjak A, Schulman H, Zudenigo D, Kupesic S, Kos M, Goldenberg M. Subchorionic hematomas in early pregnancy: clinical outcome and blood flow patterns. J Matern Fetal Med. 1996;5(1):41-4. Ozkaya E, Altay M, Gelisen O. Significance of subchorionic haemorrhage and pregnancy outcome in threatened miscarriage to predict miscarriage, pre-term labour and intrauterine growth restriction. J Obstet Gynaecol. 2011;31(3):210-2. Borlum KG, Thomsen A, Clausen I, Eriksen G. Long-term prognosis of pregnancies in women with intrauterine hematomas. Obstet Gynecol. 1989;74(2):231-3. Stabile I, Campbell S, Grudzinskas JG. Threatened miscarriage and intrauterine hematomas. Sonographic and biochemical studies. J Ultrasound Med. 1989;8(6):289-92. Pedersen JF, Mantoni M. Prevalence and significance of subchorionic hemorrhage in threatened abortion: a sonographic study. AJR Am J Roentgenol. 1990;154(3):535-7. Tower CL, Regan L. Intrauterine haematomas in a recurrent miscarriage population. Hum Reprod. 2001;16(9):2005-7. Palatnik A, Grobman WA. The relationship between first-trimester subchorionic hematoma, cervical length, and preterm birth. Am J Obstet Gynecol. 2015;213(3):403.e1-4. Sauerbrei EE, Pham DH. Placental abruption and subchorionic hemorrhage in the first half of pregnancy: US appearance and clinical outcome. Radiology. 1986;160(1):109-12. Yamada T, Atsuki Y, Wakasaya A, Kobayashi M, Hirano Y, Ohwada M. Characteristics of patients with subchorionic hematomas in the second trimester. J Obstet Gynaecol Res. 2012;38(1):180-4. Mandruzzato GP, D’Ottavio G, Rustico MA, Fontana A, Bogatti P. The intrauterine hematoma: diagnostic and clinical aspects. J Clin Ultrasound. 1989;17(7):503-10. Xiang L, Wei Z, Cao Y. Symptoms of an intrauterine hematoma associated with pregnancy complications: a systematic review. PLoS One. 2014;9(11):e111676. Mantoni M, Pedersen JF. Intrauterine haematoma. An ultrasonic study of threatened abortion. Br J Obstet Gynaecol. 1981;88(1):47-51. Bennett GL, Bromley B, Lieberman E, Benacerraf BR. Subchorionic hemorrhage in first-trimester pregnancies: prediction of pregnancy outcome with sonography. Radiology. 1996;200(3):803-6. Abu-Yousef MM, Bleicher JJ, Williamson RA, Weiner CP. Subchorionic hemorrhage: sonographic diagnosis and clinical significance. AJR Am J Roentgenol. 1987;149(4):737-40. Dongol A, Mool S, Tiwari P. Outcome of pregnancy complicated by threatened abortion. Kathmandu Univ Med J (KUMJ). 2011;9(33):41-4. Nyberg DA, Mack LA, Benedetti TJ, Cyr DR, Schuman WP. Placental abruption and placental hemorrhage: correlation of sonographic findings with fetal outcome. Radiology. 1987;164(2):357-61. Glavind K, Nohr S, Nielsen PH, Ipsen L. Intra-uterine hematoma in pregnancy. Eur J Obstet Gynecol Reprod Biol. 1991;40(1):7-10. Bloch C, Altchek A, Levy-Ravetch M. Sonography in early pregnancy: the significance of subchorionic hemorrhage. Mt Sinai J Med. 1989;56(4):290-2. Aoki S, Inagaki M, Kurasawa K, Okuda M, Takahashi T, Hirahara F. Retrospective study of pregnant women placed under expectant management for persistent hemorrhage. Arch Gynecol Obstet. 2014;289(2):307-11. Maso G, D’Ottavio G, De Seta F, Sartore A, Piccoli M, Mandruzzato G. First-trimester intrauterine hematoma and outcome of pregnancy. Obstet Gynecol. 2005;105(2):339-44. Sharma G, Kalish RB, Chasen ST. Prognostic factors associated with antenatal subchorionic echolucencies. Am J Obstet Gynecol. 2003;189(4):994-6. Dickey RP, Olar TT, Curole DN, Taylor SN, Matulich EM. Relationship of first-trimester subchorionic bleeding detected by color Doppler ultrasound to subchorionic fluid, clinical bleeding, and pregnancy outcome. Obstet Gynecol. 1992;80(3 Pt 1):415-20. Aleman A, Althabe F, Belizan J, Bergel E. Bed rest during pregnancy for preventing miscarriage. The Cochrane database of systematic reviews. 2005(2):Cd003576. Ben-Haroush A, Yogev Y, Mashiach R, Meizner I. Pregnancy outcome of threatened abortion with subchorionic hematoma: possible benefit of bed-rest? Isr Med Assoc J. 2003;5(6):422-4. Wahabi HA, Fayed AA, Esmaeil SA, Al Zeidan RA. Progestogen for treating threatened miscarriage. The Cochrane database of systematic reviews. 2011(12):Cd005943. Carp H. A systematic review of dydrogesterone for the treatment of threatened miscarriage. Gynecol Endocrinol. 2012;28(12):983-90. Pelinescu-Onciul D. Subchorionic hemorrhage treatment with dydrogesterone. Gynecological endocrinology : the official journal of the International Society of Gynecological Endocrinology. 2007;23 Suppl 1:77-81. Pandian RU. Dydrogesterone in threatened miscarriage: a Malaysian experience. Maturitas. 2009;65 Suppl 1:S47-50. Costantino M, Guaraldi C, Costantino D. Resolution of subchorionic hematoma and symptoms of threatened miscarriage using vaginal alpha lipoic acid or progesterone: clinical evidences. Eur Rev Med Pharmacol Sci. 2016;20(8):1656-63.